Two years ago, Greensburg, Kansas, was literally wiped off the map by one of the most powerful tornados in U.S. history. The F5 twister, with winds in excess of 200 mph, caused brick homes to collapse and frame houses to explode. Automobiles became missiles, hurled more than 100 yards away. More than 95% of the town was completely destroyed, with the remaining 5% being heavily damaged. With a population of only 1,700, reporters openly speculated that the town was finished. But within a few days, town residents met and decided to rebuild; they would turn Greensburg into a model green community. Curtis Nickel, a regional manager for Logix ICF, was at the first town hall meeting. “Greensburg is a low-income farming community,” he explains. “It may not be a wealthy, sophisticated town, but energy savings and disaster resistance were important enough to its citizens that they were willing to incur extra up-front costs to build what is arguably one of the most eco-friendly areas in the United States. 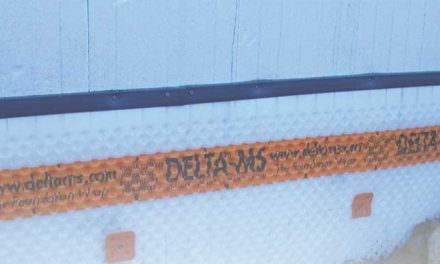 ICFs are understandably a major part of the rebuilding effort. “You don’t experience a storm like this and come out of it with an attitude of complacency,” said Daniel Wallach, executive director of Greensburg GreenTown. Wallach deserves much of the credit for the decision to build green. Immediately after the tornado, he stepped in and set up GreenTown as a nonprofit group to provide townspeople with technical assistance, classes, and other help to rebuild in an environmentally friendly way. He also set some lofty goals, encouraging every construction project in town to try for LEED Platinum certification. The town has committed that all public buildings will meet this stringent standard. To encourage corporate donations, Wallach has worked tirelessly with the media. Discovery TV has built an entire TV series around the rebuilding effort. With sustainability and disaster resistance as two top priorities, ICFs have understandably become a popular building material. “If you live in Greensburg, and you haven’t heard of ICFs, you’ve probably been living in your storm cellar the last few years,” Nickel jokes. At least eight ICF manufacturers have a presence in the town, donating materials and labor to the building effort. Many have also exhibited at the local home shows, or have been awarded competitive bid projects. says concrete also contributes 19 to 28 LEED credits. 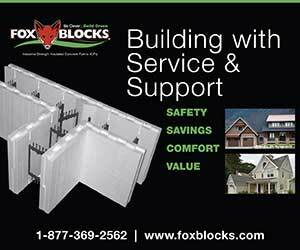 Locally produced ICFs, like the Logix plant only 20 miles away from Greensburg, allow projects to achieve two additional points for using nearby materials. Nearly twenty ICF homes have already been built in Greensburg. The first was this home, finished with half-log siding. 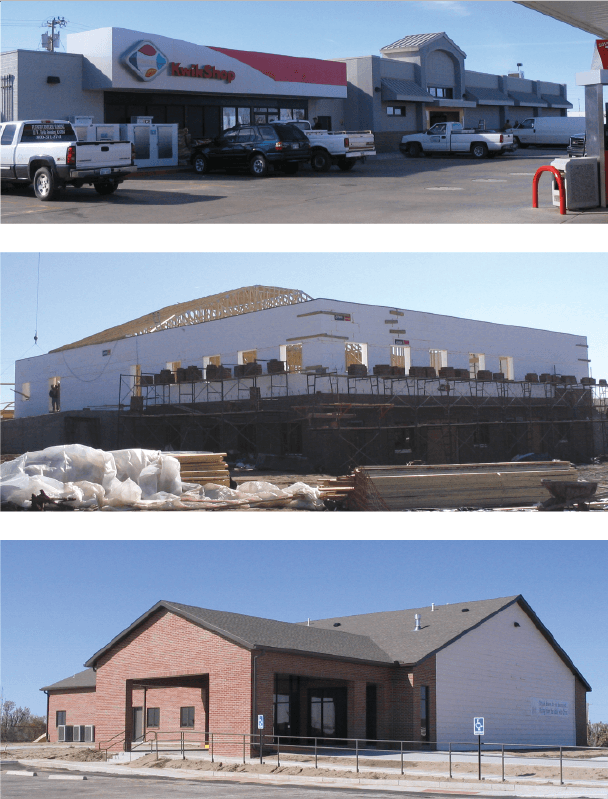 Ryan McDonald, an ICF contractor from Greensburg, has helped rebuild the town’s commercial core with disaster-proof ICFs. So far, the list includes three churches, the city hall, a grocery store, a People’s State Bank and at least two office buildings. One of the ICF offices serves as a “business incubator.” The city subsidizes the rent of fledgling businesses until they can move out on their own. Current tenants include a law firm, an architect, and a clothes boutique. Nickel reports that the Methodist Church is already expanding, adding an ICF sanctuary to the structure. Quite a few of the homes are also being built with ICFs. “We’ve seen a good amount of interest, and good amount of activity,” reports Patrick McMahon, vice-president of sales and marketing at Amvic. 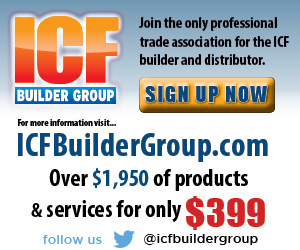 “Per capita, there’s a high percentage of ICF homes. They’ve made a real effort to incorporate ICFs into their plans. 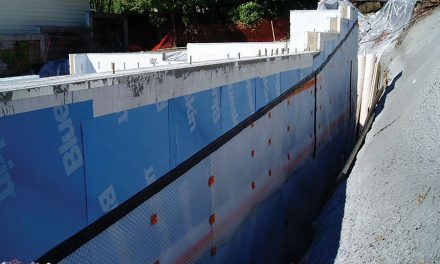 Many residents choose to build an ICF basement, and set a manufactured home on top. 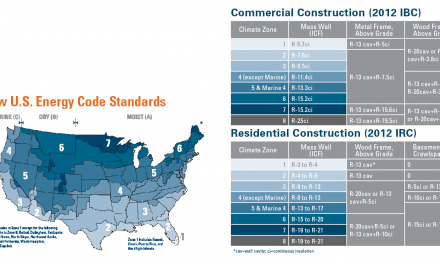 Above-grade ICF homes are also common. Nickel states that at least 15 new homes (including the mayor’s) have been rebuilt with ICFs. The new homes are energy-efficient, quiet, and built to survive whatever nature decides to unleash on Kansas in the years to come. Greensburg was in the public eye almost immediately after the tornado hit. As the site of the strongest tornado in almost 10 years, it was covered extensively by the national media, and received a personal visit from then-president George W. Bush. The decision to rebuild “green” has kept the town in the spotlight. The CBS morning show covered the one- and two-year anniversaries of the tragedy, and President Bush returned in 2008 to deliver the high school commencement address. Actor Leonardo DiCaprio took a personal interest in recovery efforts, and produced a series on the rebuilding efforts titled “Greensburg.” The documentary aired on Planet Green, a sister network of Discovery Channel. The first season consisted of 10 one-hour episodes. The second season is currently underway; six episodes have been shown so far. 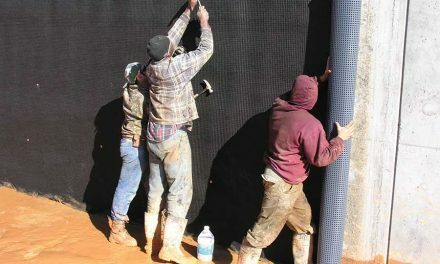 Many companies are donating product to the rebuilding effort, hoping that the publicity will help them as well. One issue that has repeatedly surfaced in the effort to build a green town is how much emphasis ought to be given to durability. Often, however, durability is overlooked in favor of features like solar panels, wind turbines, tinted windows, and water-saving toilets. For example, GreenTown recently completed a series of 12 “eco-homes” that visitors can rent during their stay. The ICF example is slab-on-grade, with no basement or storm shelter, and features walls of windows—not an ideal home to find shelter in during a tornado. Other homes in the series are SIP, and wood frame. Nevertheless, rebuilding efforts are beginning to emphasize durability. GreenTown has partnered with the American Institute of Architects (AIA) to sponsor a design contest. Winners will be announced in mid-October. 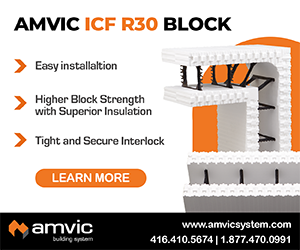 All ICF entries must use Amvic Block. Commercial ICF buildings in town include the city hall, a bank, a grocery store/filling station (top), at least two office buildings, and three churches. The Methodist church (middle and bottom) is already expanding with an ICF sanctuary addition. As noted earlier, Greensburg is not a particularly affluent town. That’s why the home plan competition is designed to encourage small, affordable house plans. It’s also a hurdle for the ICF industry. The lack of jobs is also keeping people away. About half the town’s residents have yet to come back. Some cannot afford to rebuild, while others have moved on to other opportunities and settled elsewhere.